VBG in Huffington Post: Encouraging the Community to Vote!!! A snippet of an article written about Beatriz Alas, our Community Engagement Coordinator at Lotherton, and the Village Bloggurls! As I was approaching the community room to meet Alas, I stumbled upon a group of teenage girls with a bucket of chalk, sitting on the sidewalk in front of an apartment building. I was taken aback; It was not what I was expecting on a Friday evening in the Eglinton-Lawrence area. The group of girls were drawing pictures of people voting, with arrows pointing to the nearest polling station. It was days before the federal election and they were trying to encourage people to get out to vote. This past summer, VBG went on the overnight trip to the Toronto Zoo! It was scary, fun, exciting, new, and a fantastic way to end last year’s programming. 10) The mentor groups stayed together during the entire trip and were able to bond and learn new things about each other. Vicki’s group hosted a Talent Show in which everyone shared something their good at. Other groups even learned about each other’s sleeping patterns! 9) We successfully battled the mosquitoes. 8) There was an Amazing Race scavenger hunt where we learned about all the things that make a healthy ecosystem. 6) Howling at the wolves…and getting a response back!!! 5) Feeding giraffes, which was scary, exciting, and new! 2) Hearing the lions roar at night made them seem closer than they really were. I definitely got scared!!!! 1) Spending time with just us, VBG, at this camp. These memories will last forever! Night time sing-alongs, marshmallows, s’mores…and mosquitoes! The Zoo Mobile took us from the camp site to the main zoo area. Night picture in our jammies! Check out our instagram page for more pictures!!! Villagebloggurls (VBG) had the opportunity to attend this year’s Feminist Art Conference. It is a yearly event based in Toronto that brings artists, activists, etc together. This conference was a great way to learn more about what’s happening on the internet and what people are doing about it. It included but was not limited to tips and tricks on how to fight people who try to silence girl’s voices and also how art can be a huge part of it, whether it’s used as an expression or object. It also gave VBG the opportunity to network with other girls group, and spreading the message about the great things we do and try to achieve. At the conference, VBG got into three groups, Jean’s, Richysha’s, and Jenalyn’s. Each group went to a different workshop talking about different topics. It talked about people try to silence feminist voices online using techniques like gaslighting, derailing and manipulation. The facilitator gave the group a lot of neat tips and tricks on how to fight it. They also talked about self-care and recognizing the space you take up like your privileges when fighting on the internet. This panel focused on how online activism has been online and how women are at the forefront of it. Jenalyn’s group – Girls Art League Mosaic Making. The idea of using items found at home like beans or even toilet paper rolls to tell a story and make art that relates with people. Stories were told about women who would do this to pass on messages and the group even got to create their own art. Here are some of the Villagebloggurl’s opinion on the trip. Emily – “There were lots of cool things to see. Great seeing independent artists selling their stuff. Vicki – ”There was diversity in the types of workshops. Lots of different types. The art was nice on the 2nd floor. Katlyn – it’s something for sure to take in and discuss at Mentorgurls during a Mentor/Mentee Lead Session but in a more simplified and basic (or generalized) way. Jean – “I liked that the content was useful to us girls, meaning that it was definitely something we could think about. I mostly enjoyed Rakhi, the WOC photographer and filmmaker behind the series Anarkali. She spoke about how much backlash she got for portraying Brown girls as outside of the box people put them in. And her photography was about marriage and honour killings and the sort of expectations that Brown girls (Indian girls specifically) have to fulfill in order to be acceptable. Katlyn – Sessions were really long ranging from an hour to three. Vicki – One of my workshops was so boring because we just sat there and listened to a power point presentation. The room was dark and I was falling asleep. And I wish they provided snacks to everyone. Jean – I also thought the language was not youth friendly so some of us had no idea what was going on. AND, that there was no space made for the girls to ask questions was not okay because assuming knowledge in the room is to gloss over the fact that people are at different levels of knowing and learning. Rickysha – no snacks were provide at the conference. Snacks play a pretty important part since some panels were quite long and it’s hard to focus on an empty stomach. Jean – That there was only one woman of colour in the Gender Binary panel and Feminist Guide to Fighting on the Internet workshop we attended, although there were many women of colour throughout the entire conference. So at times it was hard to see, hear, and feel ourselves in those 2 spaces. I’m not sure that that means we have to choose workshops based on who is there. Maybe it means that just because we don’t see something, doesn’t mean it’s not there, and it’s important to seek out those that we are looking for. Not really a hope for FAC as they made their facilitators list and workshop schedule available, but a reflection on our participation. Rickysha – it would’ve been nice if more girls group were invited so they could experience what villagebloggurls had experienced. 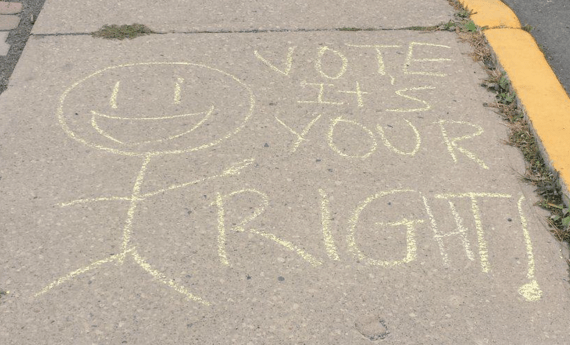 Last week, the Village Bloggurls did some sidewalk chalking and postering to bring awareness to the importance of voting in this year’s election. Even though many of the girls cannot vote due to age, they used their voices to talk about what kind of country they want to see after these elections because their voices matter as their futures are being decided by YOU, the voters. See the video below and find us on Twitter, Instagram, Facebook, and here on this website.